Automated 'home security' sentry system that targets and eliminates intruders. This is a very early reference to this idea. They're diabolically ingenious! He reached up with the little oval instrument he held. It was a recorder which registered the presence anywhere nearby of "invisible watchmen," those diabolically ingenious combinations of electric eyes and atomic beams, effective alarms that blasted down intruders without warning. Compare to the automatic gun from The Andromeda Strain (1969) by Michael Crichton and the robot gun from Aliens (1986) by Alan Dean Foster. 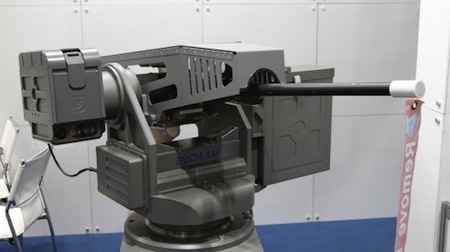 This idea is under development (using bullets instead of lasers), with some success: see the article on the DoDAMM Autonomous Robot Sentry Gun. As far as I know, automatically targeted guns didn't exist until WWII when anti-aircraft fire could be targeted using radar.